Bryn Huntpalmer is a Texas-based writer and the Senior Content Manager for Modernize.com. When she's not writing this mother of two nurtures her HGTV obsession and her love of all things interior design. Additional glimpses into her life can be found on her personal blog Her Own Wings. The Byrds famously sang, “to everything there is a season,” and that time has come for wallpaper. For the last few years, wallpaper has been coming back in a big way and with big changes. Gone are the days of long clunky rolls of paper and paste which made aligning patterns more difficult than a solving a Rubik's cube. No more tiresome and relentless peeling and scraping, not to mention all of the necessary patch work afterward thanks to the inevitable scraper mishaps. Today’s wallpaper is easy to install and simple to maintain. In fact, in most cases, a sponge is all you need to keep your walls looking pristine. In response to the surging wallpaper, trend designers are flooding the scene with stunningly beautiful patterns like we’ve never seen before. From beautiful florals to hip digital prints, this isn’t your grandmother’s wallpaper. Check out some of our favorite ways to incorporate wallpaper into your bedroom for a big burst of style! First stop, 1920s Hollywood! This subtly patterned white wallpaper has a metallic undertone that really makes the pattern pop--especially as the light hits it--without dominating the room. It’s a great way to add high style while using a neutral color palette. The light color helps the walls flow seamlessly into the ceiling, making the room appear larger. This pretty floral print could win over even the most reluctant girly-girl. Northern Rose by Graham & Brown has a great vintage feel, reminiscent of a Jane Austen novel. This simple pattern, with its vibrant pink and lush blue, inspires a nostalgia for simpler times. Don’t be surprised if you end up gloriously whiling the day away between naps and chapters of your favorite novel. This rich lilac wallpaper from Zoffany is lightly textured to add depth and an interesting contrast to plain wallpaper. Conjuring the feel of a soft woven knit fabric, this wallpaper really warms up the room to make it cozy and stylish. Incorporate other rich fabrics into the room (like this velvet headboard) for a decadent feel. Consider decorating with an exotic animal print like leopard, cheetah, or zebra. 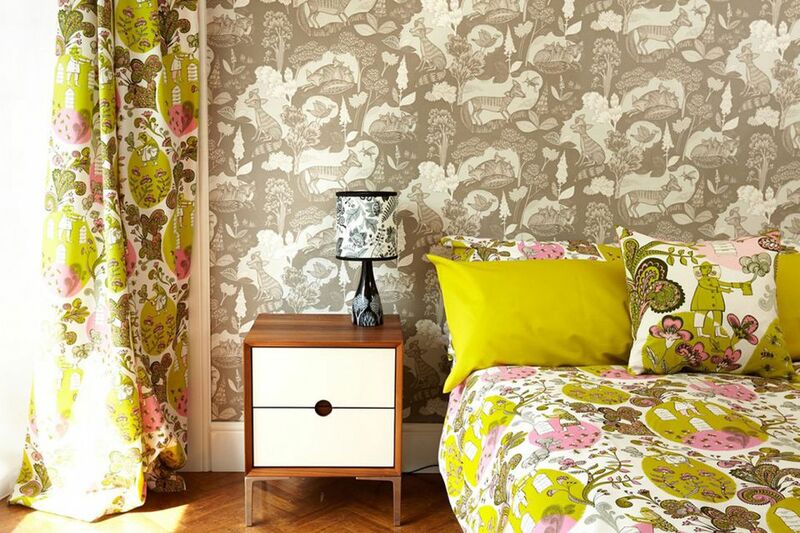 We recommend wallpapering one wall to make a bold style statement without overwhelming the room. This print informs the color palette for other design choices (bedding, furniture, carpet) in the room to create a simple, but polished look. Bird and owls are popular design motifs right now. We love this subtle and playful print, Birds & Cages by Graham & Brown. The greens and purples create soft accents that you can incorporate into your design choices for the rest of the room--think bedding, chairs, lamps--while the white base makes the room feel fresh and spacious. Removable wallpaper is a renter’s (or a college student’s) dream. It’s also great for all of us who have a hard time committing to just one pattern. This wallpaper typically goes up in small self-adhesive sheets, making it a breeze to put up wallpaper like this one from Etsy (Champagne and Strawberry) with intricate geometric patterns. Simply remove with a wet sponge to get walls back to their original starting point. Affordable, with tons of great pattern options, you just may transform your bedroom on a regular basis.